We’re thrilled to share the first of many Partner Spotlights, bringing to the forefront the work being done to close the mentoring gap in our service area. In this edition, our focus is on MENTOR (Mentors Empowering Now to Overcome Recidivism). Based in Philadelphia, MENTOR is an initiative of the First Judicial District that seeks to empower returning citizens through mentoring. We recently spoke with Program Director, Carly Friedman, to learn more. 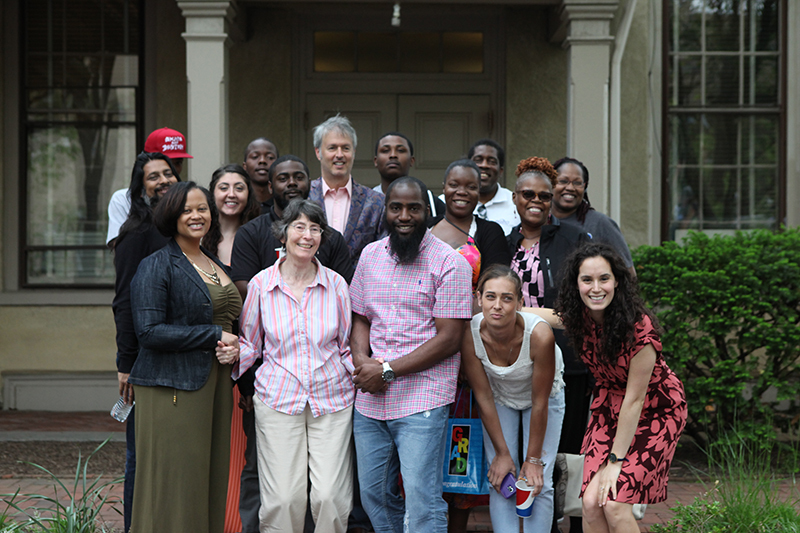 In her role, Carly oversees the development and expansion of the program, manages and facilitates grants, develops outcomes evaluation indicators and data collection methods, works with community partners, and inspires collaboration among Philadelphia reentry courts and community mentor programs. Here’s our Q&A with Carly. Tell us about the mission and vision of MENTOR, and how it is helping fill a need in the community. High recidivism rates pose a pressing problem for criminal justice agencies nationwide. In Philadelphia, approximately 39% of convicted offenders with county sentences recidivate within 24 months (Kurtz & Troy, 2015). MENTOR’s vision is a society in which individuals involved in the criminal justice system are empowered to live successful, healthy, crime-free and self-sufficient lives post-conviction. MENTOR’s mission is to interrupt the cycle of recidivism by providing a holistically supportive reentry experience through mentoring and case management, thereby reducing recidivism rates and increasing quality of life. What are the program specifics? Who are the mentors and mentees, and how is the program structured? Volunteers from the community—some of whom are returned citizens themselves—are paired with individuals 18-30 years old who have been convicted of non-violent felonies and are currently serving county sentences. These mentors serve for 12-18 months, providing emotional support and encouragement, as well as helping their participants overcome some of the traditional barriers to successful reentry. Each pair of mentor and participant is required to communicate by phone, text or email twice per week, and to meet in person at least two times each month. Subway tokens will be provided to facilitate such meetings. Participants must also attend courtroom status hearings in front of Judge Michael Erdos, who along with Judge Lisa Rau, has presided over the pilot phase of the program. At each status hearing, the Court will assess how each participant is progressing, and seek to provide assistance when appropriate. In addition, at each hearing a presentation by an expert in some life skill, or a themed group workshop (e.g., conflict resolution, job interviewing, family engagement, etc. ), will be facilitated. Successful completion of the program will result in the elimination of a substantial amount of the participant’s remaining period of court supervision, as well as healthier communities and families, and a reduction in the various human and financial costs associated with crime, prosecution, and incarceration. How many mentees were served in the program year last year? 26 mentees were served, with 12 anticipated to graduate fully from the program. What is one success story from your mentoring program that you are proud of? During a meeting between a graduating participant (whom we will call Ree) and his mentor, Ree admitted that he initially joined the MENTOR program for the reduction in probation time. He said he wasn’t interested in his mentor or what the program had to offer otherwise. Several months into his time with MENTOR, Ree was rearrested and ultimately re-incarcerated for several months. While the mission of MENTOR is to reduce recidivism, the program acknowledges that there will be bumps in the road and occurrences of relapse. The program’s intention is to be there to support each participant with their individualized reentry process, eliminating future instances of recidivism. For Ree, this meant surrounding him with holistic support and encouragement at one of the most difficult points in his life. Once again incarcerated and afforded the time to reflect, Ree began to consider his involvement with MENTOR. Slowly he began to recognize how many people cared about him from the MENTOR program, and Ree began to demonstrate heightened commitment and sincerity for change. While re-incarceration was the most challenging time in Ree’s relationship with his mentor, and the hardest for his mentor to watch, they began to forge a more genuine and empowering relationship with each other. Upon release, Ree’s internal work continued as he intentionally envisioned what he really wanted his life to look like. Now a recent graduate of the MENTOR program, Ree has been home with his wife and son for 8 months, and he plans to remain in close contact with his mentor—whom he identifies as a part of his “family.” Ree exemplified the fact that the road is not always smooth, but with determination and the willingness to ask for and accept support, success is always possible. What does the future look like for MENTOR? Nearing the completion of its pilot phase, MENTOR anticipates incoming funds from the Edward Byrne Justice Assistance Grant (JAG). JAG would fund both a MENTOR Program Coordinator in addition to a 3-year outcomes evaluation. Dr. Caitlin Taylor, Assistant Professor at La Salle University, will be conducting the evaluation. JAG also allows for the eventual expansion of the MENTOR program into a second courtroom, with each judge overseeing a cohort of 40 program participants per year. After 3 years, MENTOR will have served over 200 program participants returning home post-conviction. Judge Erdos and Judge Rau hope to inform reentry best practices in both the courts and community organizations. For more information about MENTOR, visit their website, Facebook, or Twitter pages.